Although there are many negatives to having a highly litigious society, it does serve as a force that makes manufacturers more mindful when designing their products. For the niche of sewing machines in particular, even the entry models are endowed with many automatic features that by default prevent injuries, the most common being the automatic needle threader. However, you should not relax totally when operating machinery that punches through a fabric at up to 1300 SPM speeds! This is especially true if you have an older model. Without further ado, here are some hard-learned lessons you should take to heart. 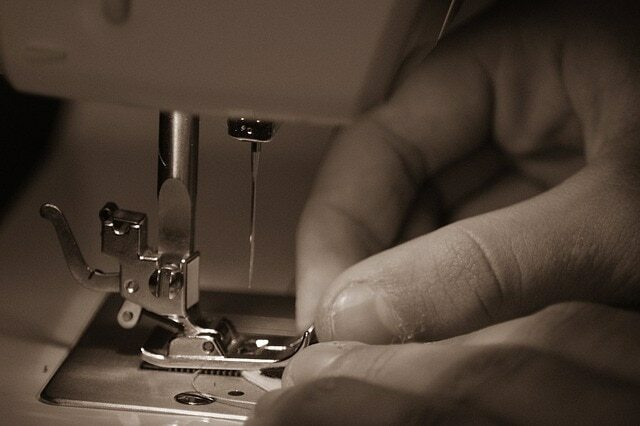 This goes for operating all kinds of machinery, even the stationary one like a sewing machine. Clutter creates disorder, and disorder creates potential for accidents. Don’t have extra tools and accessories lying around if you don’t need them. This goes for extra needles, scissors, screwdrivers, and most importantly – rotary cutters. All of them have the potential to cause injury if left in the open. Most of the best beginner sewing machine models have a storage compartment for a reason, so you use it. Additionally, don’t have any cords lying around. The power cord for the sewing machine especially should be out of sight and reach, and not on the floor where you use your feet for operating pedals. Obviously, the main danger of a sewing machine emanates from its main feature – threading needle through a fabric at high speed. Therefore, you should always keep an eye on the needle, preferably a well illuminated one with the machine’s own lighting system. That means no turning your head to the TV in the background, or when someone is trying to talk to you. In an ideal situation, you should not have such distractions present in the first place, but if you do, be cognizant of the need to always keep an eye on the needle. If something requires your attention, stop the machine, no matter how quickly would it take to respond. Otherwise, you significantly increase the chance of running the needle through your fingers. Only by making strict safety rules do you remove such a possibility. No, not the kind of nails you punch with a hammer, but the ones that women tend to have – painted and elongated or attachable nails on fingers. For some reason, women still have this habit, but if you intend to work with a sewing machine on a regular basis, it is a bad idea to maintain it. Any delicate work is more difficult to do with long nails, but you are just asking for trouble if you have long nails and work with a sewing machine. Therefore, it would be a good idea to trim them. Further, you would save quite a bit of money for not having to buy nail polish and nail removal anymore. And speaking of your own body parts as potential danger conduits, if you have a long hair make sure it is securely tied back. Getting your hair stuck on a running sewing machine is a nightmare scenario indeed. Not all accidents come from dealing with the sewing machine itself. As any good sewer knows, sometimes you have to use iron in order to flatten the fabric completely for the smoothest sewing possible. An iron is the best tool to have for this purpose, especially for chain-pressing. Needless to say, when you intermittently shift between ironing and sewing, make sure that there is an ample room in your workspace, so you don’t have to contort yourself or use a non-dominant hand for the job. Going steady and focused keeps the burns away! If you already have prescription glasses you are good to go. If not, it might be wise to invest in getting a lightweight protective eyewear. The reason for this is that, sometime in your sewing journey, you will encounter projects during which something will pop off the fabric. This likely may be as a result of sewing across a straight pin or something else. No matter what it is, the force applied will cause it to rapidly launch straight in your face! You would be glad to have had the foresight of wearing protective eyewear then, wouldn’t you? Additionally, protective eyewear nowadays also has the option of being coated with film that increases visual acuity, especially in low lighting. So, there is another reason to include it in your prevention arsenal. It is safe to say that practically all accidents come from one source – mental state. If you are stressed out, tired, or distracted, the likelihood of an accident skyrockets drastically no matter what you are doing, and sewing is no exception. With that in mind, be more aware of your state of mind and what can you do to get in proper shape prior to starting the work.